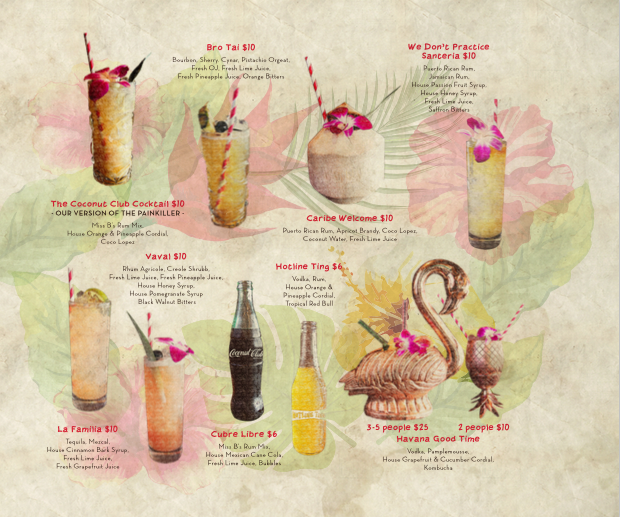 The tiki-inspired Miss B’s Coconut Club is now open in Mission Beach at the space formerly occupied by The Boardwalk, less that 50 feet from the beach. Island-inspired dishes make up the Coconut Club’s unique cuisine, where bold Caribbean flavors meet fruit-infused cocktails and local craft beer. This spring, celebrate San Diego’s nautical and maritime history and be sure to plunge into Miss B’s for a classic, Caribbean-inspired menu that’s bringing tiki to the beach. The kitchen at Miss B's revolves around island dishes and is under the helm of Executive Chef Christina Pancheri, who formerly helmed the kitchen at Tavern in Pacific Beach. Brunch is served daily at Miss B’s until 2pm. Feast on dishes like the hot coconut rum French toast with slices of Kolach toast drizzled with Miss B’s house rum, toasted coconut, mango-berry syrup and fresh berries. For lunch order a hot sandwich like the Bistecca Sandwich - a Cuban roll piled high with citrus marinated steak topped with watercress, fried queso fresco and seasoned crispy onions served with your choice of tostones (plantain chips) or house fries. 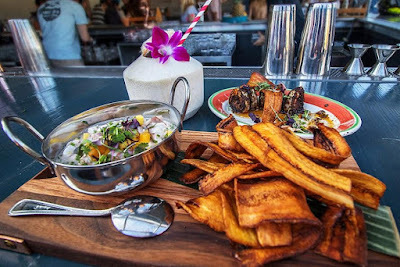 For starters, don't miss the Seafood Ceviche with fresh shrimp and fish marinated in citrus with serrano peppers, red onion, cilantro, coconut milk with a side of plantain chips for dipping. For a seafood dish, try the Jumbo Jerk Shrimp with jerk seasoned jumbo shrimp, mango chutney and plantain chips. The full lunch menu will be available after 2pm. and once 4pm hits, enjoy a selection of dinner entrees ranging from Cuban to Dominican classics. 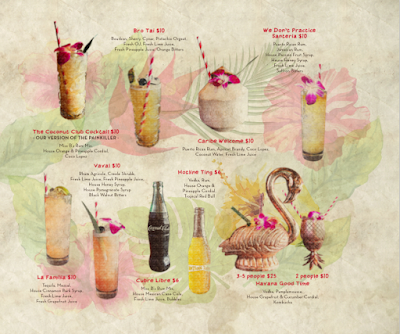 Toast to your meal with one of Miss B’s well-balanced cocktails, including shareable, tiki-inspired punches and bowls. Sip on the Havana Good Time handcrafted with vodka, pamplemousse, house grapefruit and cucumber cordial and topped off with on draft kombucha. This handcrafted cocktail can be shared among two to five people. If you’re feeling extra tropical and bubbly, try the Hotline Ting featuring vodka, rum, house made orange and pineapple cordial and tropical Red Bull. The Coconut Club Cocktail is Miss B’s version of a Painkiller, so cure all your lingering pains with this fruity fusion of Miss B’s rum mix, house orange and pineapple codial and coco lopez. If a fruity drink isn’t your thing choose from one of over 17 Miss B’s tiki pints on draft. For soft and non-alcoholic brews have a glass of fresh coconut water harvested in-house, Yirgacheffe Ethiopian nitro cold brew or choose from guava-mango or pomegranate kombucha. Miss B’s offers plenty of beverages to quench everyone’s thirst either inside or on their large outside patio. Evoke your inner islander, wipe the sand off your feet and dive into Miss B’s Coconut Club this season. 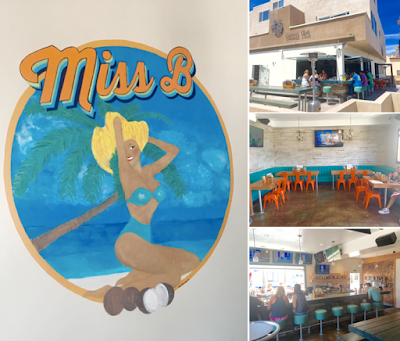 Miss B’s is located at 3704 Mission Boulevard in Mission Beach and is open every day of the week from 11am to 10pm. For more information, visit missbcoconutclub.com.